Games, moral and social activities, craft suggestions, and much more for your dentists in training! 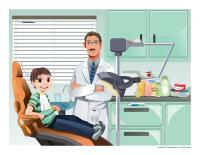 A dress-up doll, posters, word flashcards, and other printables that will help you demystify the world of dentistry for little ones. 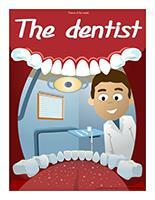 (Open thematic poster-The dentist) Print, laminate, and decorate the walls of your daycare with all kinds of posters. 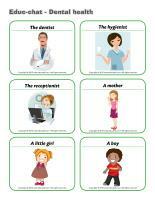 (Open educa-theme-The dentist) Print and laminate. Use the different illustrations to decorate a corner of your daycare and present the theme to your group (and their parents). 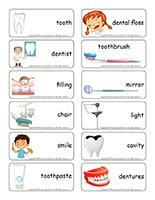 (Open educa-decorate-The dentist) Print, laminate, and cut out the various items. Use them to decorate your daycare and set the mood for the theme. (Open stickers-The dentist) Print on adhesive paper to create an original collection of homemade stickers. (Open garland-Dental health) Print. Let children decorate the items. Cut them out and use them to form a garland that can be hung within your daycare or near your daycare entrance. Stick pictures of teeth on tables, on the floor, and on the walls of your daycare, at children's eye level. Transform your relaxation area to make it look like a dentist's office. 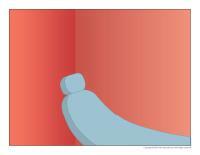 Set a long chair in one corner so children can stretch out their legs and lie back. Let children take turns pretending to be the dentist and using the items in a special thematic bin: toothbrushes, dental floss, empty mouthwash bottles, paper masks, empty tubes of toothpaste, paper bibs, eyedroppers, empty medicine bottles, pillows, dolls, notebooks, pencils, glasses, a platter for tools, syringes (no needles), plastic or rubber gloves, dental health posters, etc. Line up a few chairs to represent a waiting room and add a few toys. Photograph each child's smile and display them on a wall. Encourage them to guess who each smile belongs to. (Open Poni discovers and presents-Dental health) Print the cards. Laminate and cut them out. Use a Poni puppet (or another puppet children are familiar with) to present the pictures to your group. (Open educ-chat-Dental health) Educ-chat is a game which includes several illustrations representing subjects, verbs, and predicates. Use it to help children make complete sentences and add to their vocabulary. Print, cut out, and laminate the cards. Make three piles (subjects, verbs, and predicates). Have children pick three cards, one from each pile, and "read" the sentence. The sentences will sometimes be quite silly, that is what makes the activity fun! You can also choose to place the cards yourself and have a child "read" the sentence. Since dental health plays an important role in this theme, why not invite the tooth fairy into your daycare? We have prepared a series of letters from the tooth fairy for your group. (Open Tooth fairy letter) Print the letters and put them in a glittery envelope that you can deposit in an easy to find location within your daycare each morning. Read the letters to your group throughout the theme and complete the suggested activities. Wear a white blouse and a special hat that you have glued several teeth illustrations on to greet children in the morning. Purchase several sets of false teeth and hide them throughout your daycare. These can be purchased in big-box stores. Hang colourful toothbrushes from the ceiling. The pictures may be used as a memory game or to spark a conversation with your group. Use them to decorate your daycare or a specific thematic corner. 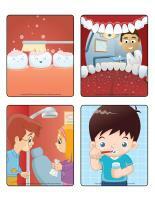 (Open picture game-The dentist) Print, laminate, and store the pictures in a Ziploc bag or in your thematic bin. 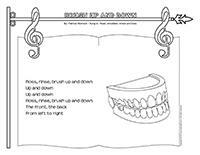 (Open activity sheets-The dentist) (Open activity sheets-Dental health) Activity sheets are suggested for each theme. Print and follow instructions. 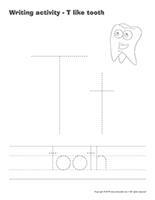 (Open writing activities-T like tooth) Print for each child or laminate for use with a dry-erase marker. 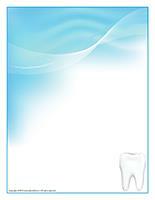 (Open stationery-Dental health) Print. The stationery can be used to communicate with parents, in your writing area, or to identify your thematic bins. Pieces of aluminum paper children can use to wrap blocks to represent fillings. White blocks to represent teeth. Splash paint on a large piece of white paper using old toothbrushes. With or without stencils, the results will be impressive. Use colourful toothpaste as paint. The end result will be shiny and children's paintings will smell great! Aluminum paper to represent fillings. Use evaporated milk to paint teeth. Once dry, the teeth will sparkle. Coloring pages related to the theme (teeth, smiles, etc.). Pictures of teeth on which children can stick pieces of gum. Encourage children to draw another child's smile to represent an X-ray. Transform your role play area to make it look like a dentist's office. Stick the name "Dr. White Teeth" on the door and display pictures of teeth on the walls of your area. A long chair, a small flashlight, and a few pictures can suffice. If you wish, you may add the following items: gloves, masks, and a white shirt. Your dentist may be able to provide a few posters or old X-rays. You may also include accessories such as empty mouthwash bottles, mirrors, towels, eyedroppers, empty medicine bottles, syringes (without needles), etc. 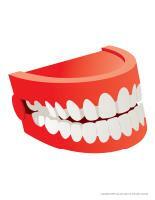 Purchase sets of false teeth and set them on a table along with toothbrushes. Add dolls and let children practice their brushing technique. Photograph each child's mouth (smiling, open wide, etc.) and display the pictures on the walls. Children will love showing their pictures to others. If your area is big enough, you can also add a waiting room. Memory game with illustrations related to the theme (educatall.com picture game). Association game involving food items that are good/bad for dental health. Ziploc bags filled with toothpaste and sealed...children will enjoy manipulating them, the texture is quite interesting. Sorting game involving animals that do and don't have teeth. Toothpaste modeling dough (see creative recipe) or white modeling dough. A box filled with all kinds of toothbrushes. Books about teeth, dentists, etc. Books about fairies, especially the tooth fairy. Connect the dots (teeth or toothbrushes). Activity sheets related to dental health. Games with educatall.com word flashcards. Have children act out a tooth that is slowly breaking through a gum, a growing tooth, a loose tooth, a tooth falling out, etc. With 4 and 5 year olds, this activity will help them prepare for losing their first tooth. Encourage children to stand straight like the bristles on a brand new toothbrush or bent over like the bristles on an old toothbrush that needs to be thrown away. Show them examples of both. At the sink...brush your teeth! At the sink, encourage children to rinse their mouth with water. They will love spitting it out! Invite a child to play the role of the dental hygienist and inspect the teeth of the children in your group once they are done brushing. 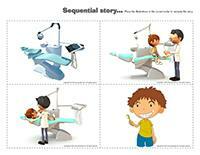 (Open sequential story-Dental health) Print, laminate, and cut the illustrations. Children must place the illustrations in the correct order to recreate the story. Fill a box with a variety of toothbrushes. Encourage children to use them like puppets to invent stories. 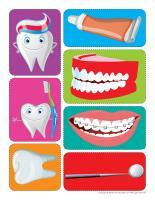 (Open scene-At the dentist's office) Print, laminate, and cut out the items on the second page. Children can use them to create a variety of décors on the scene provided. (Open my tooth path) Print, laminate, and secure the illustrations on the floor to create a path which leads to areas frequently visited by children such as the bathroom or cloakroom. If you prefer, the illustrations may also be used to delimit your various workshops. (Open game-This is my spot-Dental health) Print two copies. Laminate and cut out the cards. Glue one copy of each card on the table using adhesive paper. Drop the other copies in a bag. Children take turns picking a card to determine their spot at the table for the day. You may also use the cards to determine naptime spots or for your task train. 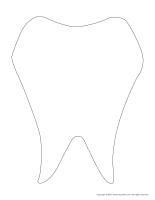 (Open tooth with holes) Print, laminate, and punch holes around the contour of the tooth. Children can thread string, ribbon, or a shoelace through the holes. Provide dry cereal or pasta children can thread on a long piece of dental floss. If you wish, use mint dental floss to add a scented touch to this activity. (Open sparkling smile game) Print and laminate. Hide the tiny healthy and decayed teeth throughout the daycare. Stick the mouth on a piece of heavy cardboard and display it on a wall, next to a chair. You are the dentist. Children search for healthy teeth. Each time a child finds a healthy tooth, he/she must stick it in the mouth as quickly as possible. If a child brings you a decayed tooth, he/she must sit on the dentist's chair for one minute. The goal of the game is to find all the healthy teeth to create a sparkling smile. (Open teeth) Print and laminate. Hide tiny teeth throughout the daycare. When you give the signal, children play the role of the tooth fairy. They must find and collect as many teeth as possible. There is no winner for this activity. The only goal is for children to have fun. You may let each child bring one tooth home at the end of the day. Give each child a long piece of dental floss. Encourage them to walk around the daycare, sliding the dental floss back and forth between toys and other items. Provide toothbrushes and let children practice their brushing technique on toys. In your construction area, provide pieces of aluminum paper and invite children to wrap toys and blocks with them to represent fillings. Invite one child to play the role of the germ. The other children are teeth. If the "germ" touches a "tooth", the tooth has a cavity and must sit down. The game continues until all the teeth have been touched by the germ. Choose another child to play the role of the germ and start over. (Open teeth) Print, laminate, and cut out. Draw a face with a wide open mouth on a large piece of cardboard. Give each child a small tooth and let them try to stick it as close to the mouth as possible while blindfolded. Let children play in your water table with toothbrushes. Encourage them to wash toys using the toothbrushes. Fill an empty tissue box with miniature marshmallows. Draw tiny black spots on one marshmallow (cavity). Provide pasta or salad tongs children can use to remove the "teeth" one by one. The game ends when a child removes the tooth with the cavity. Put all the marshmallows back in the box and start over. Draw a large open hippo mouth on a piece of cardboard. Arrange several miniature marshmallows around the inside of the hippo's mouth. A few marshmallows should be colored black underneath. With clean clothespins, children remove the teeth one at a time to find the hippo's cavities. Variation: If a child finds a cavity, he/she must put a healthy tooth (marshmallow) back in the hippo's mouth. 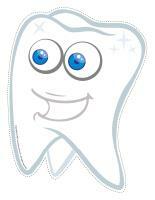 (Open tooth with holes) Trace the tooth shape on white cardboard and cut it out. Use a hole-punch to make holes all the way around the contour of the tooth. Encourage children to thread dental floss through the holes. Have children form a circle to represent a mouth. Ask them to close their eyes. While they have their eyes closed, remove one child from the circle. Have him/her sit in the centre of the circle and hide him/her with a blanket. When children open their eyes, they must guess which child is the missing tooth. (Open teeth) Print, laminate, and cut out several tiny teeth. Deposit them on your parachute. Have children hold the edges of the parachute firmly and shake it gently at first, before lifting it high above their heads to send the teeth flying through the air. As the teeth fall to the ground, children must rush to collect them as quickly as possible. Variation: If you wish, you may use miniature marshmallows instead. Trace a mouth shape in your sandbox and let children take turns drawing a tooth inside the mouth. Once the mouth is complete, erase it and start over again. Variation: You can do the same thing with sidewalk chalk. Draw teeth in your yard using sidewalk chalk and encourage children to color them. Draw a large mouth shape in your sandbox and invite children to use buckets to fill it with oversized teeth. 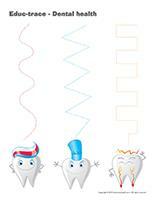 (Open educ-trace-Dental health) Print for each child. Children must trace the lines using the correct color and then color the corresponding object using the same color. 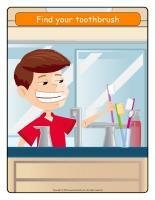 (Open educ-same and different-Dental health) Print and laminate for durable, eco-friendly use. Children must circle the illustration which is different in each row. 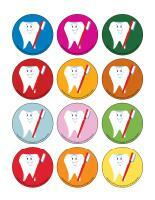 (Open educ-colors-The dentist) Print and laminate for durable, eco-friendly use or print for each child. Children must associate the items to the correct color by drawing a line using a crayon of the corresponding color. (Open educ-pairs-Dental health) Print. Children must draw a line between identical illustrations or color them using the same color. For durable, eco-friendly use, laminate and use with dry-erase markers. (Open educa-symmetry-The dentist) Print. Children must color the drawing on the right (black and white) to make it look exactly like the drawing on the left side of the page. (Open educ-ascending-descending-Dental health) Print the cards. Invite children to place them in ascending and descending order. (Open hunt and seek-Dental health) Print and laminate. Children must search for the items in the scene. (Open teeth) Print. 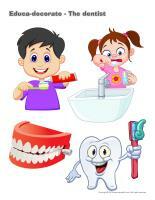 Provide children with different sizes of teeth and have them place them in ascending order, from smallest to biggest. Cut a variety of food items out of grocery store flyers. Display a healthy smile and an unhealthy smile on a wall. Encourage children to stick the food items that promote dental health around the healthy smile and the food items that are not good for their teeth around the unhealthy smile. 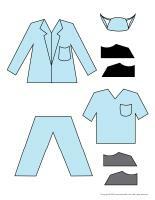 (Open dress-up dolls-The dentist) Print and laminate. Set the pieces on a table. Children will enjoy dressing the doll different ways. Photograph each child's smile, making sure that their faces are not visible (zoom in on their mouth). Display the pictures on a wall and invite children to identify who each smile belongs to. Create a thematic bin that includes: toothbrushes, dental floss, empty mouthwash bottles, paper masks, empty tubes of toothpaste, paper bibs, eyedroppers, empty medicine bottles, pillows, dolls, notebooks, pencils, glasses, a platter for tools, syringes (no needles), plastic or rubber gloves, dental health posters, etc. Set a long chair next to your bin and let children take turns pretending they are the dentist and examining the other children's mouths. 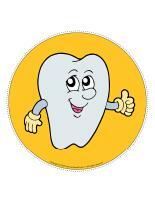 Invite a dental hygienist or a dentist to visit your group. This may be someone you know or, if you wish, you can contact your dentist's office for references. Use dishcloths to make masks like the ones worn by dentists. Fold the cloths in two, make a hole on either side and thread a piece of string through each hole. Tie the strings of a mask together behind each child's head. Let children use tiny mirrors and flashlights to examine their teeth before lunch. After lunch, repeat this activity to help children understand why it is important to brush their teeth after meals. With supervision, have each child bite down on a Styrofoam plate. Observe each child's dental impressions and encourage them to notice the differences. Purchase several different types and flavours of toothpaste. Have children smell each one and discuss the different scents. Which scents do they prefer? Which scents do they dislike? Let hard-boiled eggs soak in tea or dark soda overnight. They will turn brown. Encourage children to brush them with toothpaste. Discuss the results. Deposit several objects related to the theme in a pillowcase (empty tube of toothpaste, empty mouthwash bottle, toothbrush, etc.). Children take turns touching an item in the pillowcase without looking at it and trying to identify it. 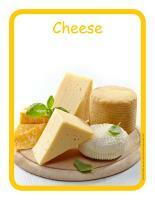 (Open educ-poster-Cheese) Print and laminate the posters to present this everyday food item to your group. Display them next to the table where children eat or in your kitchen area. (Open Mr. Shiny Tooth and Mrs. Cavity) Print and display both characters. Explain to your group that they must determine whether each food item is healthy or unhealthy for their teeth and associate them to the correct character. You can use food item illustrations available in the educatall club or food items cut out of grocery store flyers. Draw the outline of several teeth on cardboard or print the following models (Open teeth) and stick them on cardboard. With your group, melt marshmallows in a microwave-safe bowl for 30 seconds. Let children take turns stirring the marshmallows. Melt them for 10 more seconds. Deposit the melted marshmallows in the centre of the table and give each child a Popsicle stick they can use to spread the mixture inside the shapes. Mix the ingredients together and store your homemade toothpaste in an airtight container. (Open models-The dentist) Print the models. Use them for different crafts and activities throughout the theme. 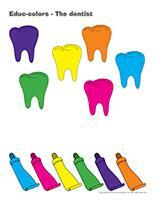 (Open stencils-Dental health) Print and cut out the stencils. Children can use them to trace and paint a variety of items related to the theme. Transform an empty paper towel roll to represent the tooth fairy's wand. Simply cut a tooth shape out of white cardboard and stick it to the end of the roll. Encourage children to decorate their wand as they see fit. Invite children to cut smiles out of catalogues and magazines. Stick them on a large white banner. Use white chalk to draw teeth on black construction paper. Cut teeth out of yellow construction paper and glue them on white paper. Dip a toothbrush in white paint and brush it over the teeth. Provide toothbrushes and different colors of toothpaste. Let children explore different ways they can use the toothbrushes for painting. This activity can be quite messy. Plastic tablecloths can help limit cleanup time. (Open sparkling smile game) Print the game. Cut several tiny pieces of aluminum paper. Stick them on the teeth to represent fillings. 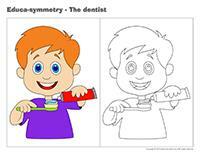 (Open coloring pages theme-The dentist) Print for each child. (Open complete the drawing-Dental health) Print for each child. Encourage them to complete the drawing by adding the missing elements. 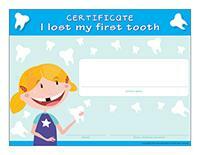 (Open scrapbook-Dental health) Print this new page for each child. Help children complete it before adding it to their scrapbook. If you do not have a scrapbook for each child in your group, visit the Scrapbook section of the educatall club.